Finally got the boat done and on the water today....very pleased. I did not use a coaming around the cockpit...and rather reduced the volume with a slanted section under the legs. and a venturi with a plug..I also did not use the stock peaked decks....they involved another fiberglass and thickened epoxy seam...which would have added around 4-5 lbs...and I had some awsome mahogany. 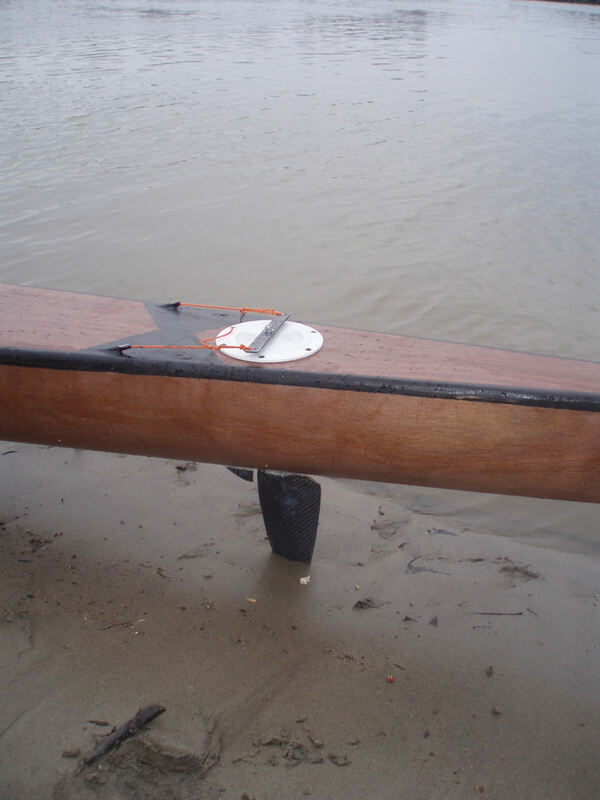 I also made a carbon fiber understern rudder and rigged it so it could be removed and a rear carbon kick up rudder put on for shallow water...have done this on my surfski's...river paddling reality. finally I shortened the iako's (outrigger arms) and rigged the deck attachment so I could trim the angle for a light ama and wanted a really beefy attachment. 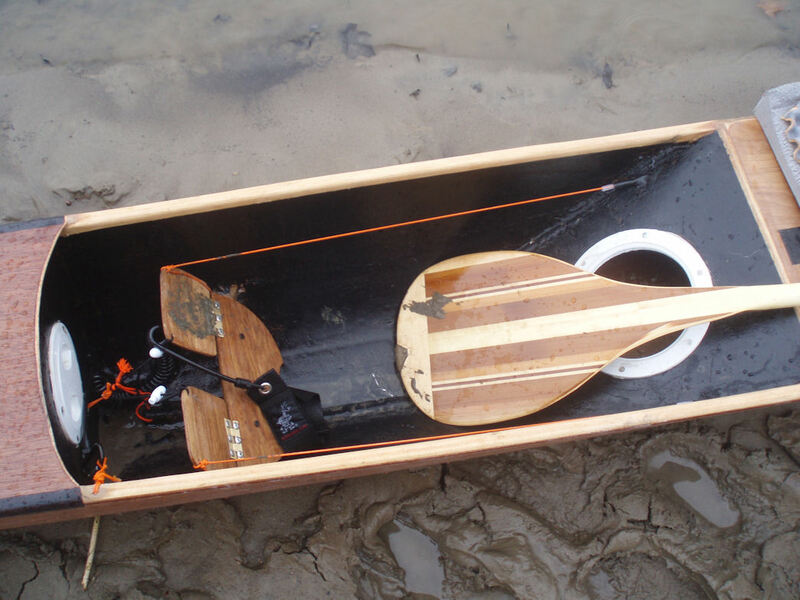 The boat is light....main boat around 30 lbs and ama and arms cant be too much more...can lift up with one arm and toss on my shoulder for walk up ramp. all and all...nice boat...and very pleasing to the eye! 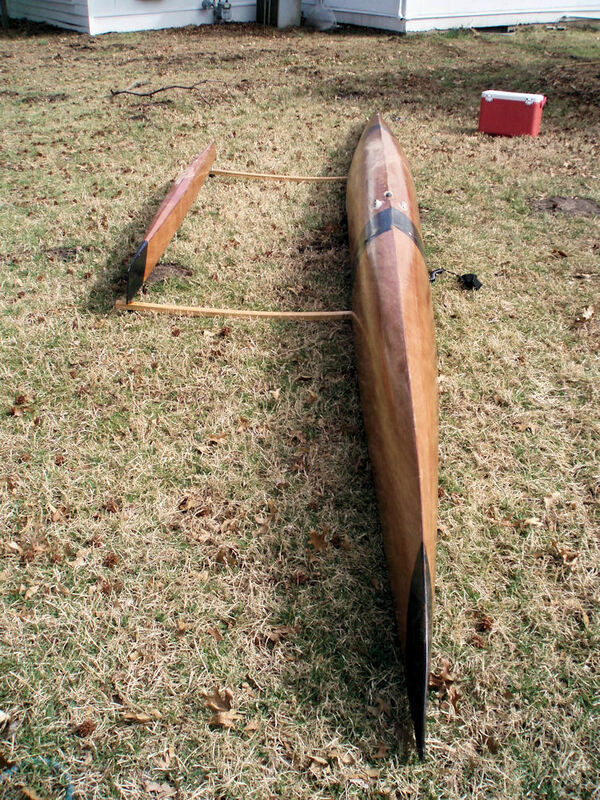 so final conclusions.....boat is a rounded hull with tons of rocker....a perfect flat water boat would likely reduce this rocker some.....steering is responsive...freeboard with no coaming is just fine for typical river conditions and very comfortable position to paddle in......and most important...boat is fast. Sweet ride Bryan! You did good. Wow! Nice work. Your boat is beautiful. It is even better to hear that she paddles so good. Hopkins, you dog!!! That boat is so cool--------------I'm adopting you right now, you can quit work. You, Alma and the kids can move in with us. Lets make boats!!!!! I thought you would like that boat.......problem is that building a boat is actually alot of work (and I enjoy every minute of it )...I get tendonitus from sanding with each build and have to chill for a while.....but of course, I get obbessive and build non-stop, until she is done (shop lights and power tools late at night on weekends...wonder why my neighbors all avoid me?? ?....just joking...it never fails that just when I cook a pot of epoxy...someone comes up to talk about the project...boats are like a magnet)......could not build them full time...I would physically fall apart!!!! However, I really liked what happended with the toutured plywood... ...no chines and rounded hull..once you pull the boat into shape...it is very strong.........I have been thinking of taking the basic hull approach...and widen a bit for a sit in boat...kayak style... take all the rocker out and allow for a partial flare behind paddler and cant gunnels in at feet for close catch....try for more flatish hull in center section...kinda like a dsx or spencer extreme with not so much wing...actually...more knifeish like the Vanduesen Mohican...but with wood.....drop one layer of glass on front end and small bulkheads front and rear... it would be very light (20 pounds or so) and plenty strong for Missouri River conditions........I have the wood, I have the epoxy and cloth....just need to let the dust settle on my last boat...and oh, yeah.....actually get out and paddle versus shaving wood!!! 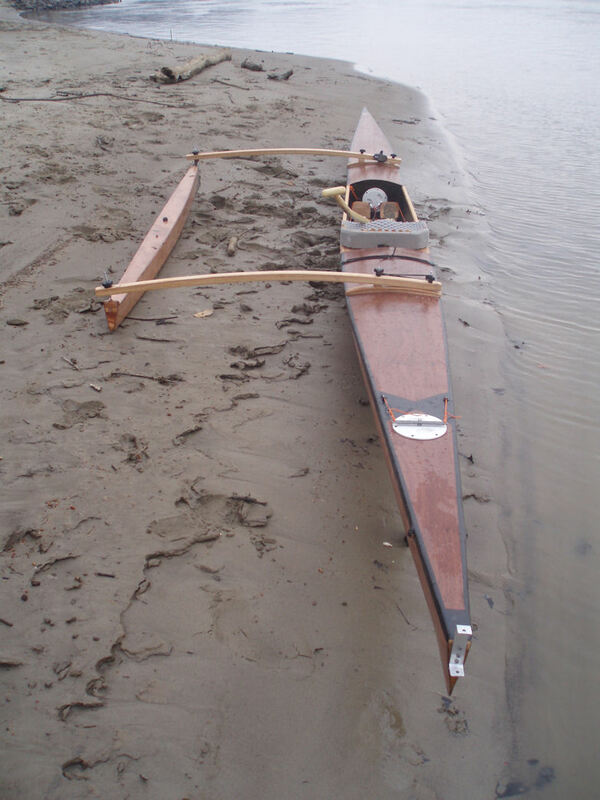 I am a fan of Hopkins Boats--heck, I even own one!!! Apply some marine epoxy..kind you get at ace hardware in srynge ( (or gel coat...I hate working with gel coat )...would not recomend raw resin......apply less than you think (might want to try out on a soda bottle to get a feel for what I am gonna describe before actually doing the boat)...once you have a dab or two of the epoxy on the spot...then take a piece of clear packing tape and gently presse down on top....then slowly massage the glue around under the packing tape and smooth out with fingers,etc ...then let dry. Next day...peel the packing tape slowly off...Walla! you will have performed a redneck vacum bag job...the surface will be shiny smooth and no sanding required....if you need to trim a high spot...use a very sharp knife or razor blade on edge to scrap off the cured epoxy or gel coat......now if you must, you can use one of those auto paint touch up paint thingy's to try to match colors...me...I dont match colors anymore...the spot is just gonna wear again...and I call it a battle wound...proves you are not a poser kayaker.......that way you dont kill yourself trying make it like new....I have really stressed out trying for that before....not worth it!! I have to talk to you about it. I know, I know . 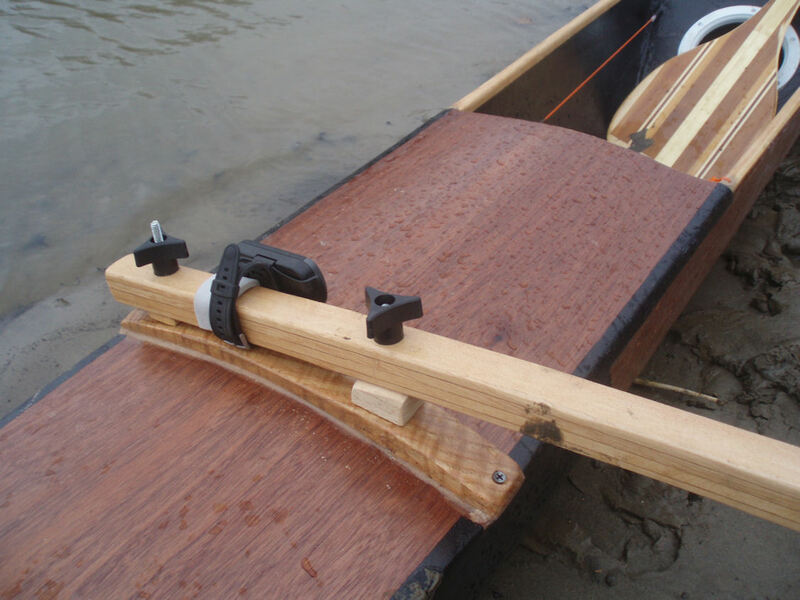 . . . . . .
Any of you boat guru types ever install a foot board and tiller stearing on a kayak before? I'd like to explore that for my QCC700. It has pedal stearing which is a problem if you use a lot of leg drive ... I go tail wagging down the river. I've considered heel blocks, too. That'd be my plan B should a tiller steering system prove too onerous. 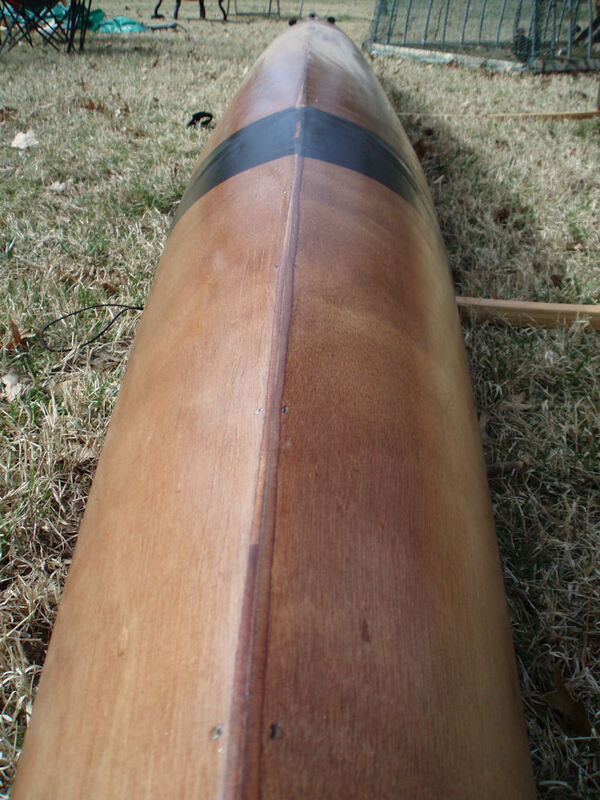 Here are some pics of the hull of the outrigger .....as you can see it is really rounded....as rounded as as any carbon layup boat or rowing shell...and so is fast and performance orientated......I really bent the wood to get a boat with a 15 1/2 inch beam for this ride........so.....my thoughts are if I can bend for that...I can bend for a wider boat..and a sit in kayak......and work a little bit of flat spot like on the new generation surfski's...reduce the rocker big time.......wood is as good or better than the common foam construction used for carbon boats...and is actually stronger and a cinch to repair. 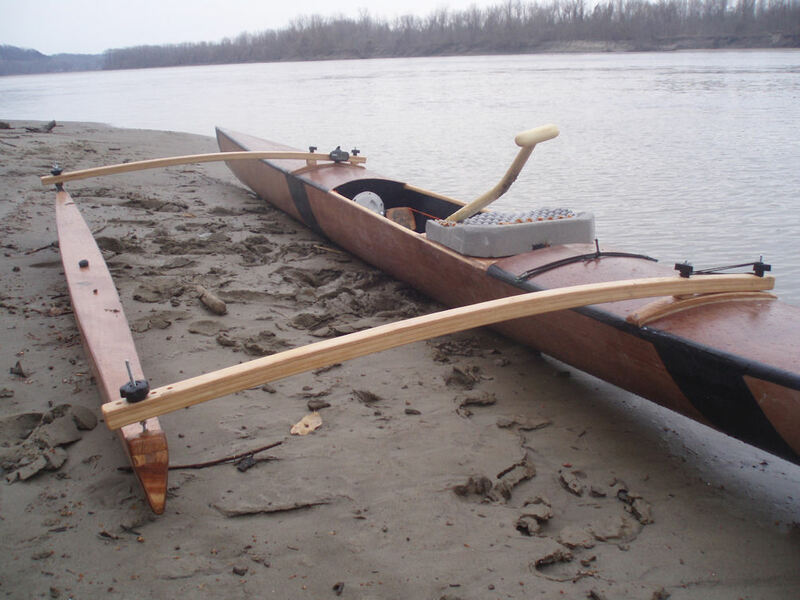 So I spent some time with cardboard paper toy boat prototypes...and just today cut the hull sections from 3mm plywood for a tws style racer...but built for the missouri river...i.e. does not have to take TWS abuse....hope for a light boat...with a little bit more freeboard. 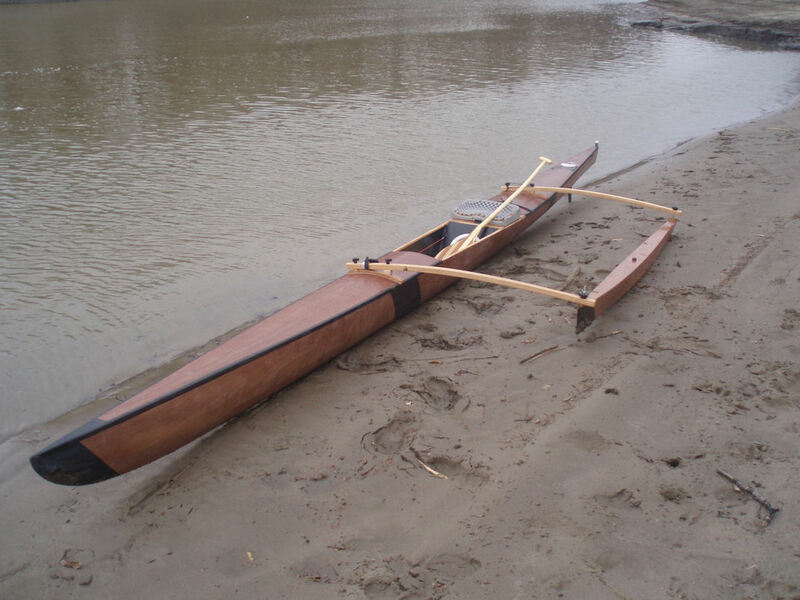 My idea is for a sit in Kayak and not an outrigger...the boat pictured here is based hull-wise on a Marzan design outrigger...but it was my first bent plywood build and got me thinking of the possibilities...FYI you have to change a boat by 10% to have "new design" and avoid copy right infringements....I actually already did that with my Marzan-style boat (cockpit, deck and outrigger arm attachments were all a different approach than the Marazan design)....but what I am interested in is the application to K-1 boat. If it goes well...I plan to make plans available with full size cut out templetes and picture by picture instructions on puting her together....because I really think anyone with even minor tool experience (can you saw wood straight and not cut your fingers off...ok...your in) can build one of these boats...and you can totally customize your boat to your quirky needes or personality...............................so stay tuned and wish me luck...if the boat is a good one.....then I anticipate a boat folks could make for less than $600 that would be smoking fast (I would sell plans for beer money ).....................and oh yeah...I plan to have an adjustable beam...so you can adjust rocker (which will be mininal) and stability to your skills or conditions. Sure hope this works out...now that I have put my mouth where my saw dust is. shot of hull from rear....those things on the boat are venturi's...to drain the cockpit.